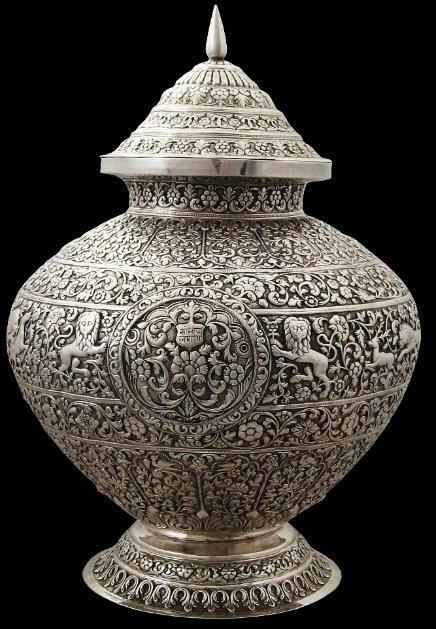 This stunning and highly unusual vase and cover is in the Jaipur style – an infrequently encountered genre of Indian silver and one that is rarely mentioned in the literature. It has a squat, bulbous form, which narrows to a raised, flared neck on which sits a tiered cover with an elongated bud-like finial. 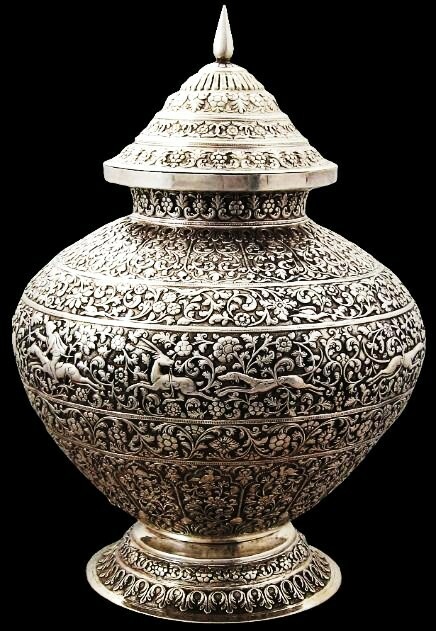 The vase sits on a flared foot. The cover, base and foot are all covered in dense, exceptionally fine scrolling foliage and flowers. Small birds are discretely worked into the foliage here and there. 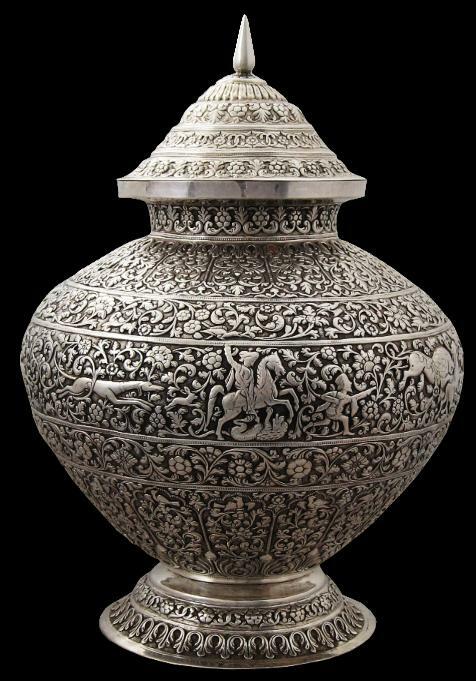 The central band that runs around the body of the vase features animal hunt and chase scenes: a rider on a horse chases a lion which chases an antelope; a greyhound chases another antelope; a greyhound chases a hare; a turbaned hunter on a horse drives a pike into a lion; another hunter on foot aims a gun at a lion which is attacking a horse. And then, amid all this detail, is a roundel with rampant lions to either side, and which is filled with scrolling foliage and flowers and a small armorial cartouche in which there are two lines of Devanagari script. 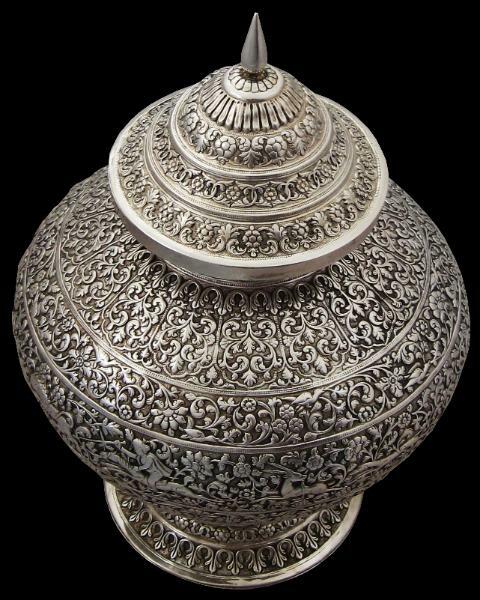 puja (ritual or prayer) related, or it might be a wedding gift. Inside the vase is a round steel tube which sits neatly into the vase and which is open at both ends. It is not clear what purpose this serves. 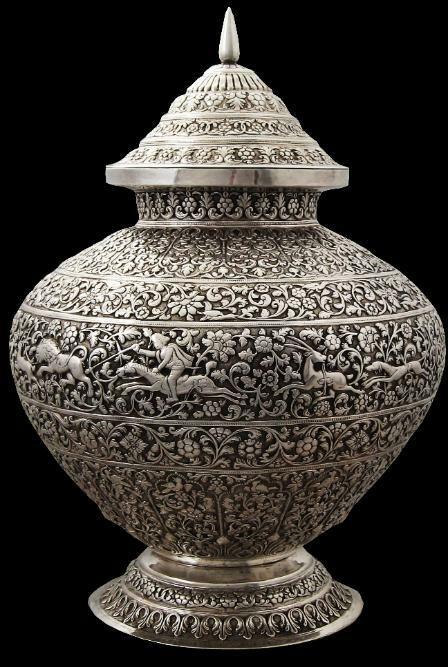 Overall, this is an extraordinary piece of Indian silver, which almost certainly dates to the first half of the 19th century.